Newton Satterlee was truly a Bronaugh pioneer. He is considered to be one of the four founders of Bronaugh. In fact, there was an argument at one time that the town should have been named Satterlee rather than Bronaugh. Many believed that Newt was more involved in the development of Bronaugh as a town than was its namesake, W. C. Bronaugh, who never really lived there. 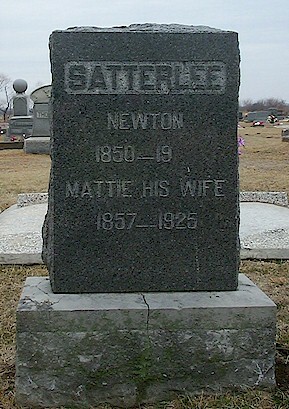 Newt Satterlee married Martha (Mattie) Cohenour in 1879. Their grave marker is in Worsley Cemetery, Bronaugh. You will note that Newt's death year is not engraved. Mike Cherry tells that Newt is definitely buried in Worsley Cemetery. Mike shared Newt's death certificate which shows that Newt was born March 10, 1850 in Illinois and died April 10, 1939 at Bronaugh at the age of 89 years, 1 month. The informant for the death certificate was Newt's sister-in-law, Mrs. Charles Brubaker. The physician who signed the certificate was Dr. Eddleman of Liberal. Funeral director was Hays Funeral Service of Nevada and burial was on April 13, 1939. Background music is Shine On Harvest Moon.